It’s time for more holiday ideas through Xyron’s 30 days of Holidays! There is nothing I like more than a home-made Christmas. Brings back great childhood memories of making ornaments and decorations with my mother and siblings. I’ve come up – with some help from Pinterest – with some quick and easy decorations that really lend that home-made look to the home and gift items that are equally fun to do with the kids. 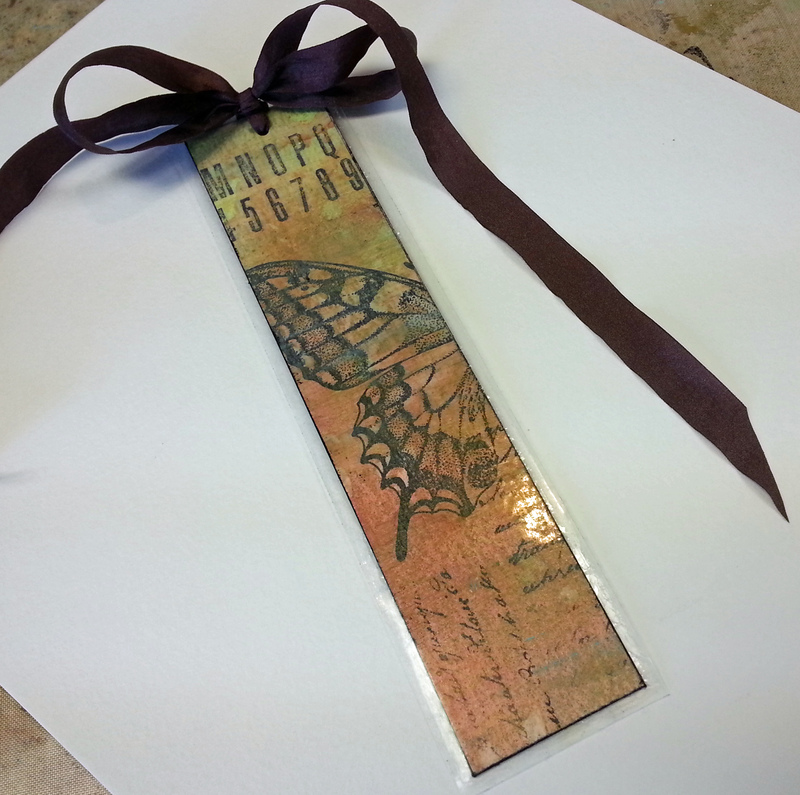 First up is a book mark. This was so easy to make with Xyron’s laminate cartridge and it’s a great way to preserve your art or that of a child – show me a grandma or grandpa who reads who wouldn’t love their grandchild’s art work done up in a useful gift. I sliced up an art journal page to about 1 1/2″ by 7″ sections. I ran them through my Xryon 5″ Creative Station with the Laminate/Permanent Adhesive. Then I stuck them together back-to-back and trimmed around the edges, punched a hole with the Crop-a-Dile and tied a pretty ribbon through the hole. My next project is one I found on Pinterest but revised it to make it even easier to assemble. I started with an empty toilet paper tube and flattened it with a bone folder. I wanted to print some holiday clip art onto a book page so after finding some free downloadable art I printed the two pictures on office paper to line up placement. I was able to add just a tad of adhesive with the Xyron Mega Runner to all four sides of the book pages to hold them in place on the office paper. The paper (with the adhered book pages) was reinserted into my printer so the images could be printed on the book pages. I ran the printed book pages through the Xyron Creatopia with permanent adhesive and gently peeled it off the backing. 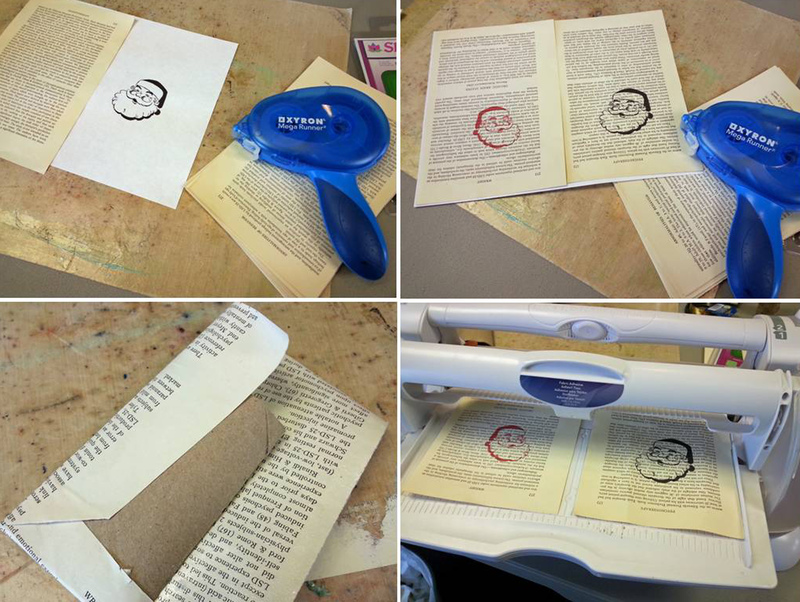 Lay the toilet tube on the sticky side of the book page so the image is centered in the front of the tube. 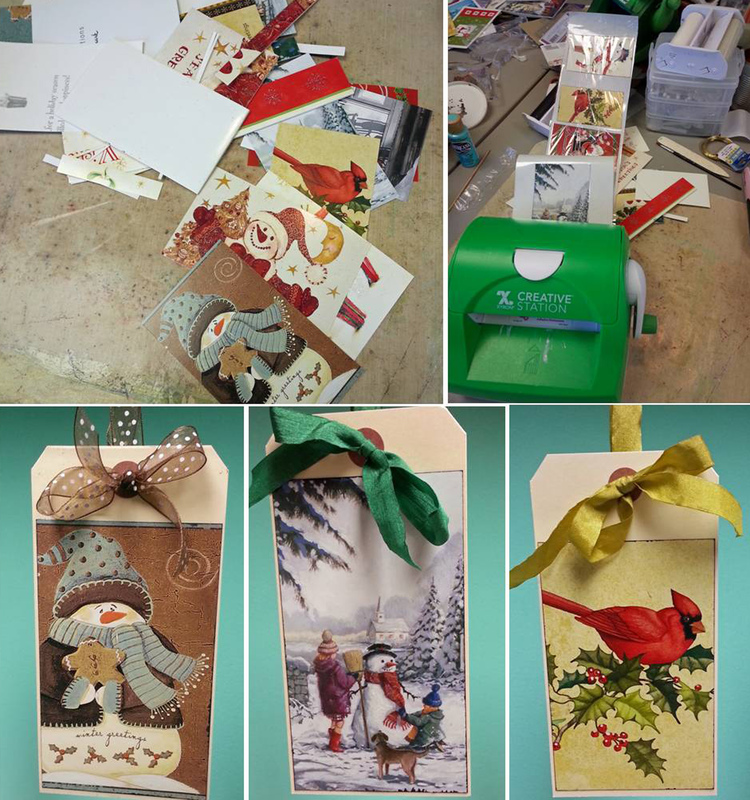 Wrap the page around the tube, fold up the bottom and clip the top sides of the book pages so you can tuck the top flaps down inside the tube. Use the Teresa Collins Stapler to secure the bottom of the tube. Pierce a hole on each side of the tube top and add some wire. 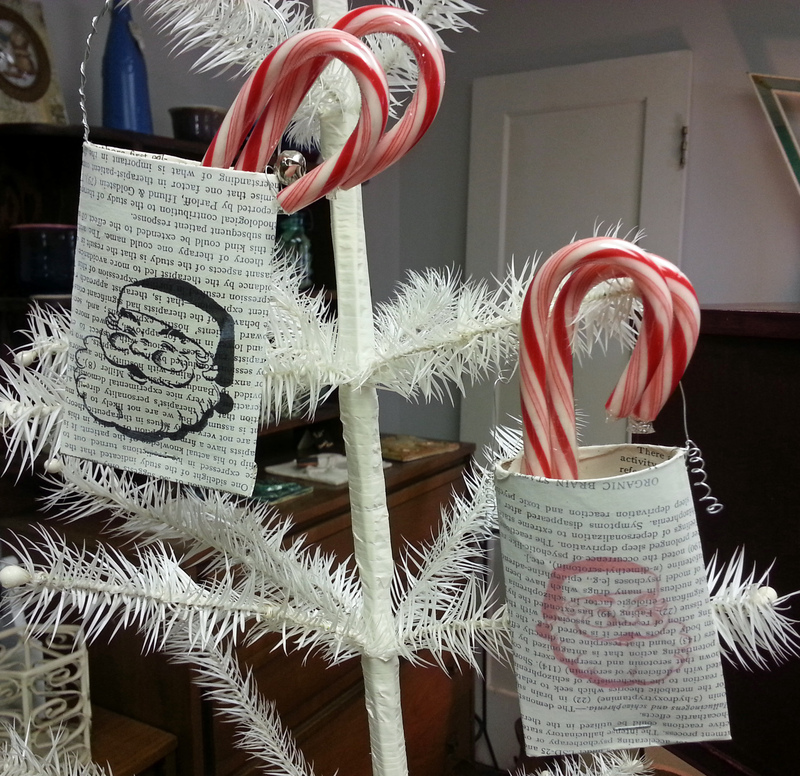 I added a jingle bell to one and white-washed one with a dilution of gesso. Stuff with special candies, candy canes, or other small items and hang on the tree as a special treat for visitors. 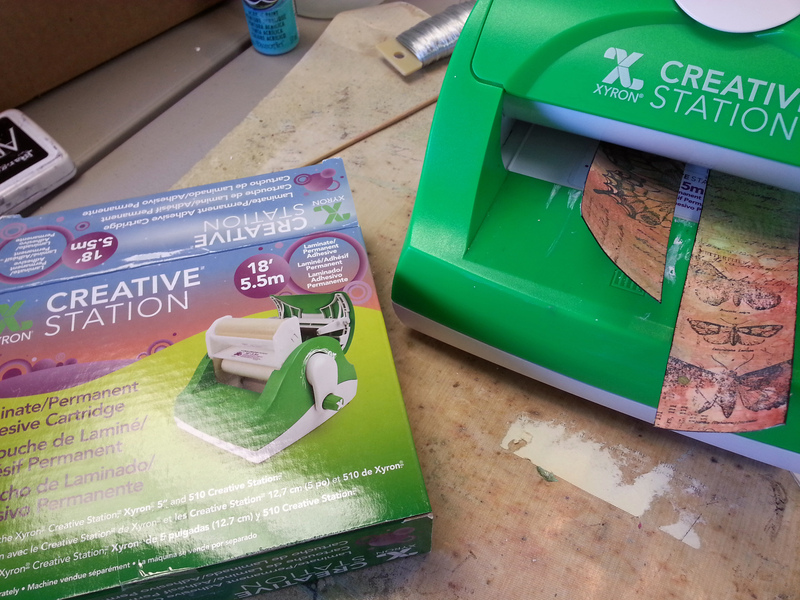 My next project uses Xyron Laminate Magnet refill in my Xyron 5″ Creative Station. 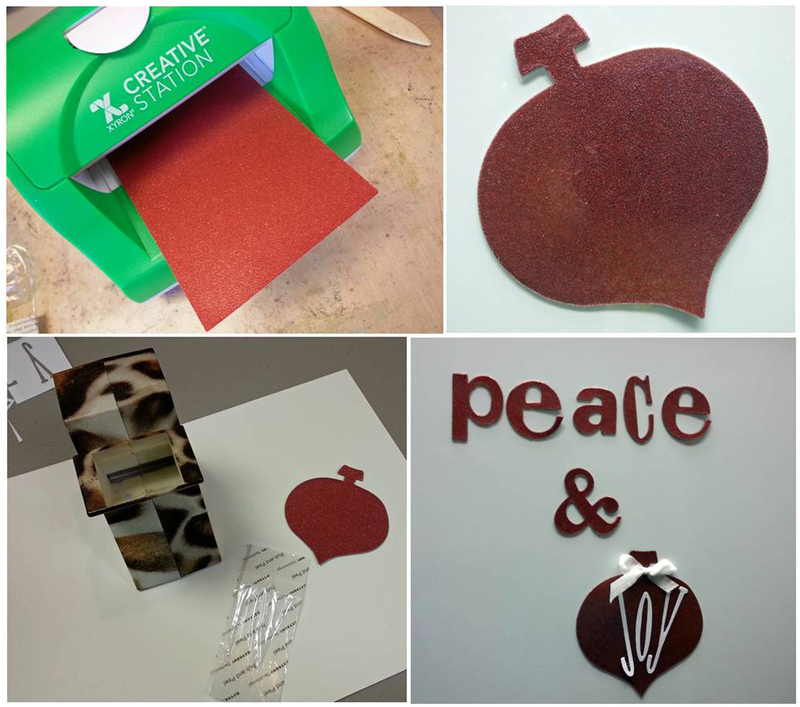 I took a piece of red glitter paper from DCWV Christmas & Winter Glitter Cardstock Stack and ran it through the Creative Station to put full-coverage magnet on the back and laminate on the top. 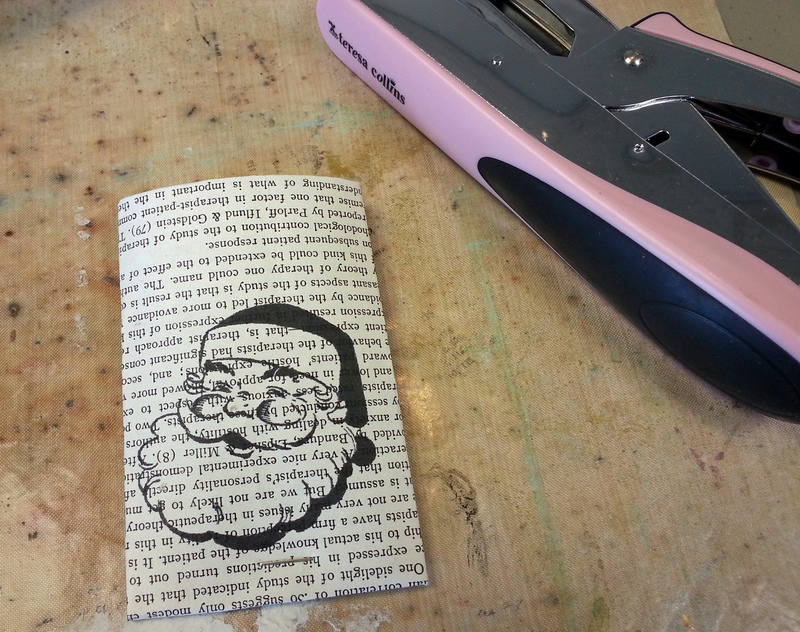 Then I die cut it using a Christmas ornament die. I added the word ‘JOY’ that was die cut and run through the Xyron 1.5″ Sticker Maker. A pretty ribbon finishes the look. I also die cut letters to spell ‘peace’ from the scraps. It looks so cute hanging on the fridge! For the final hooray I grabbed my bag full of last year’s Christmas cards. How many years have I saved Christmas cards always intending to do something with them – well, this is the year! This actually was the easiest and my favorite. I cut the card fronts just a hair smaller than the manilla tags I wanted to use, inked the edges and ran them through the Xyron 5″ Creative Station with permanent adhesive. My original plan was to make gift tags from these, but once I got them all done and laid out they looked pretty enough to hang so that’s what I did. I simply strung them some twine and hung them from a shelf. Aren’t they cute! When I actually get around to Christmas shopping I can slip the tags off the twine one-by-one and use them on the packages. Make sure to visit the Xyron Facebook page to check out other great projects from the rest of the designers. There’s been some great ones and we ain’t done yet! Banners – with family photos on each one. Love these ideas … might try my hand at the tp one! Thanks, Candy! Please do give it a try. They’re so cute!